HP Umpire Nic Lentz ejected Nationals Hitting Coach Kevin Long (strike three call; QOCY) in the top of the 2nd inning of the Nationals-Brewers game. With none out and none on, Nationals batter Trea Turner took a 1-2 slider from Brewers pitcher Jhoulys Chacin for a called third strike. Replays indicate the pitch was located over the inner half of home plate and at the hollow of the knee (px -.472, pz 1.534 [sz_bot 1.589 / RAD 1.466]) and that all other pitches during the at-bat were properly officiated, the call was correct. * At the time of the ejection, the Nationals were leading, 1-0. This is Nic Lentz (59)'s first ejection of 2018. Crew Chief Mark Wegner now has 3 points in Crew Division (2 Previous + 1 Correct Call = 3). *This pitch was located 1.812 vertical inches from being deemed an incorrect call. 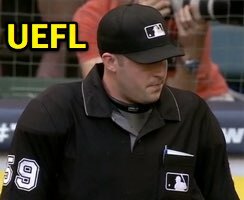 This is the 104th ejection report of the 2018 MLB regular season. This is Washington's 4th ejection of 2018, 2nd in the NL East (NYM 5; WAS 4; MIA 3; ATL 2; PHI 0). This is Kevin Long's first ejection since May 21, 2016 (Adrian Johnson; QOC = Y [Balls/Strikes]). This is Nic Lentz's first ejection since May 23, 2017 (Clint Hurdle; QOC = Y [Out of Base Path]).